MIT has developed a jet-injection system that is superior to the devices in use for the past fifty years; the new device can deliver varying amounts of medicine to different depths inside the body. 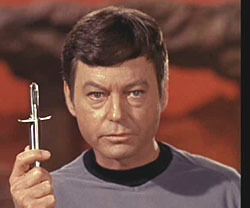 SF fans are thinking about the hypospray, the universal injection tool in the Star Trek universe. The idea of a hypospray was still pretty new for sci-fi fans in the 1960's. The jet injector gun, upon which the hypospray is based, was patented in 1960; it was used to beat smallpox. A jet injector gun uses a high-pressure, needle-narrow jet of the injection liquid. It is powered by a gas cylinder or cartridge. Workmen have been accidentally jet-injecting themselves since the 19th century (with grease). Via MIT; see the more evolved hypospray from Star Trek: The Next Generation. Thanks to Winchell Chung (aka @Nyrath) for the tip on this story.